It's disappointing that producer Apatow and screenwriter Seth Rogen would follow up "Superbad" with a film that is such a blatant retread of previously covered material about an awkward skinny teen, a loud-mouthed fat teen and an even skinnier, squeaky-voiced über-nerd trying to navigate the tricky waters of high school. "Superbad" was an extremely funny, hugely successful embodiment of teenage fears and dreams (and centered around an awkward skinny teen, a loud-mouthed fat teen and an even skinnier, squeaky voiced über-nerd). 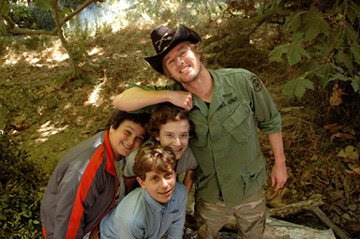 "Drillbit Taylor," which focuses on the same thing for a younger crowd (note the less restrictive PG-13 rating), is nowhere near as good.